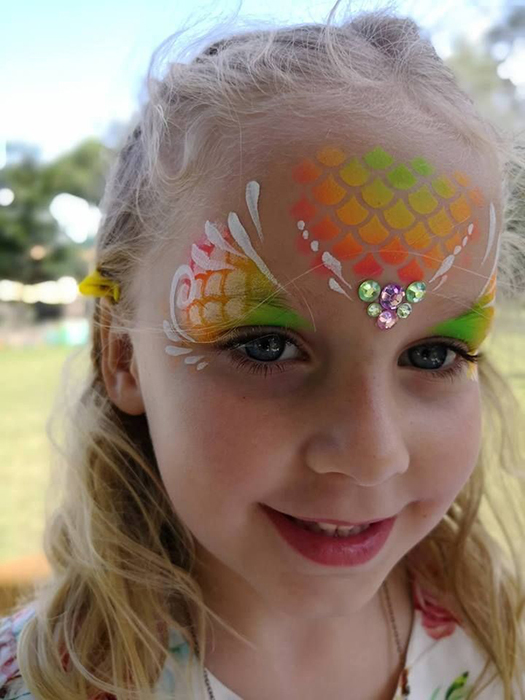 If you’re planning a mermaid celebration in 2019 or just want to look “extra” at the beach, take it one step further with face painting, body art, or temporary tattoos! We’ve found a few inspirational ideas that you could pass along to the artist or even attempt yourself! 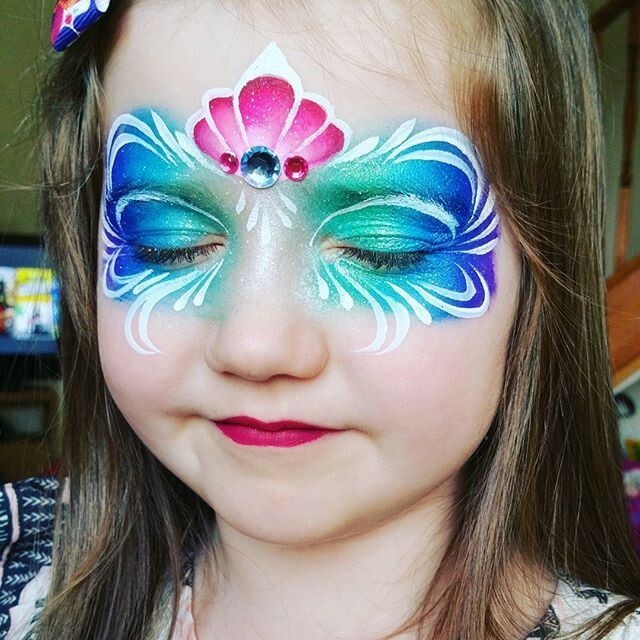 We love how magical this eye-focused makeover looks! 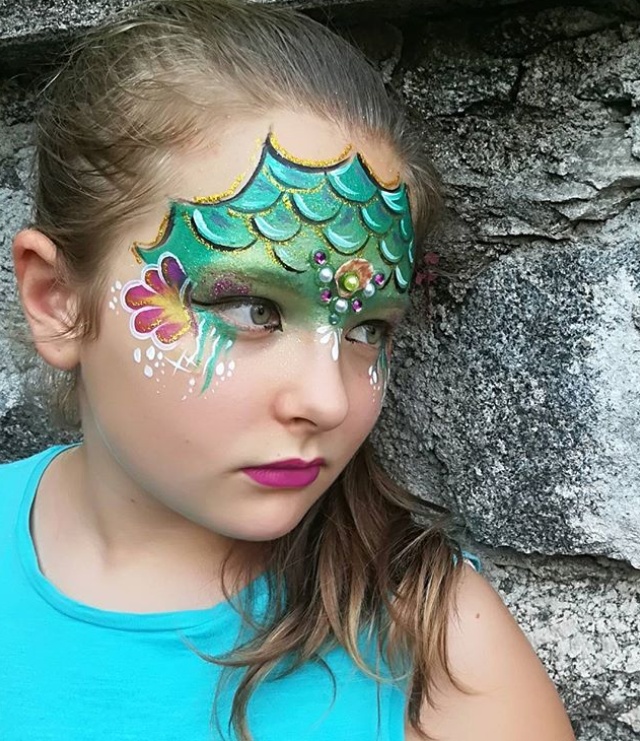 Featuring bold colors, faux gems, and shimmery paints, this vivid color palette is an absolute showstopper and coordinates with our Fiji Fantasy mermaid tail! 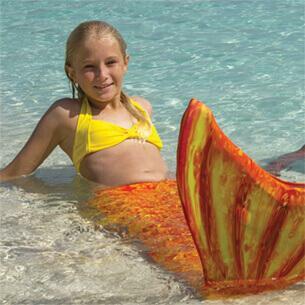 Because mermaids have scales, it’s not a bad idea to go embrace the obvious. Utilizing much of the forehead, we truly appreciate the attention to detail around the eyes. And wait—are those pearls? Notice how a bright red lipstick really completes the mermaid look! There’s something about elegance that truly captivates those yearning to become a mermaid princess. 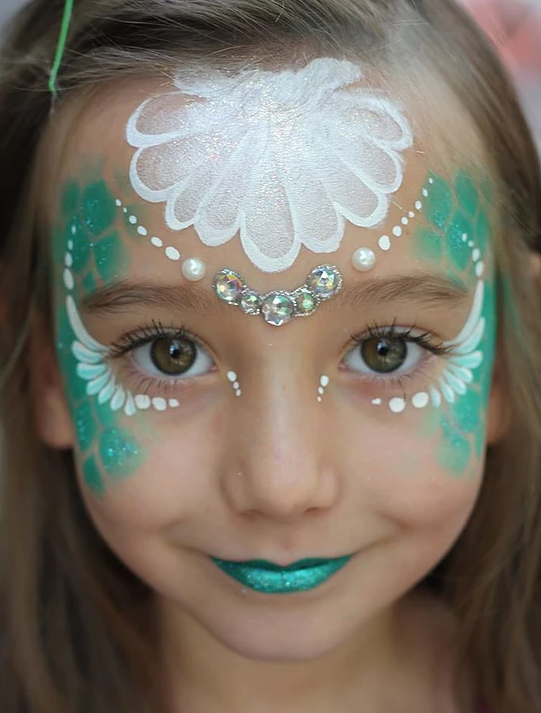 This magical look uses minimal colors and strategically placed sparkly gems. You could go for more natural colors, or you could embrace the dramatic tones of a rainbow-scale pattern! Not only do these scales feature a gradient color scheme, the spacing between the scales really makes the shades pop! Try this scale stencil for a similar look. Doesn’t this laughing mermaid make you smile? 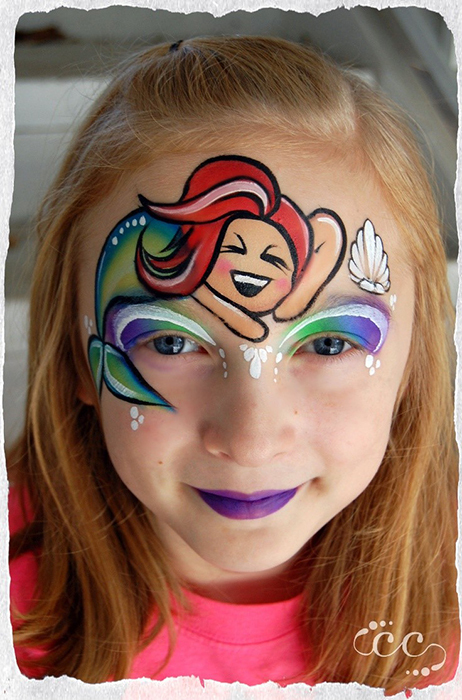 We love the vivid colors and comical appeal of this cute, cartoonish face painting. Now that’s artwork with character! Need a step-by-step tutorial? Check out the YouTube tutorials below if you’re feeling extra DIY vibes! Whether you’re going for a light-hearted or luxurious look, you’ll find easy-to-follow instructions that just might inspire you to pick up those paints and makeup brushes! The most classic mermaid look of all involves fishnet stockings! See how this video illustrates all the ways you can apply scales to your skin! But why stop at the face? Continue the color to your shoulders, arms, legs…whatever you desire! Who knew there were so many looks? Whether you use paint or makeup, the end result is “shore” to be MERMAZING! You could even gather your pod pals for a day of glamour! If wearing your mermaid tail isn’t a big enough attention-getter, here are a few ways to truly steal the scene! From body paintings that look like a work of art on canvas, to simpler scales that glitter in the sunlight, the world is your oyster when it comes to creativity. You don’t have to go to extremes to make an impression at the beach. 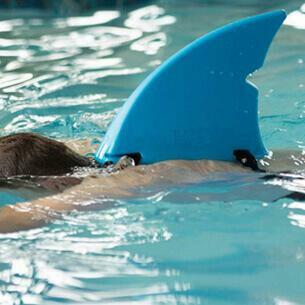 But if you do, here’s some finspiration that’s bound to make waves. 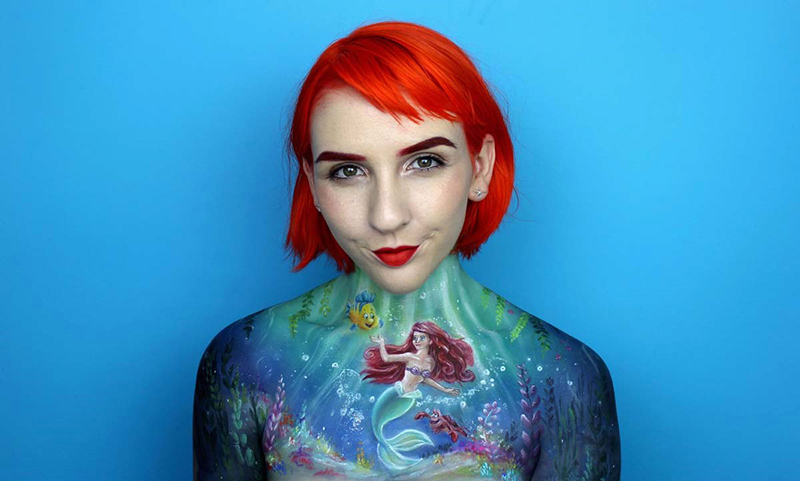 Take it one step further with waterproof body paint! 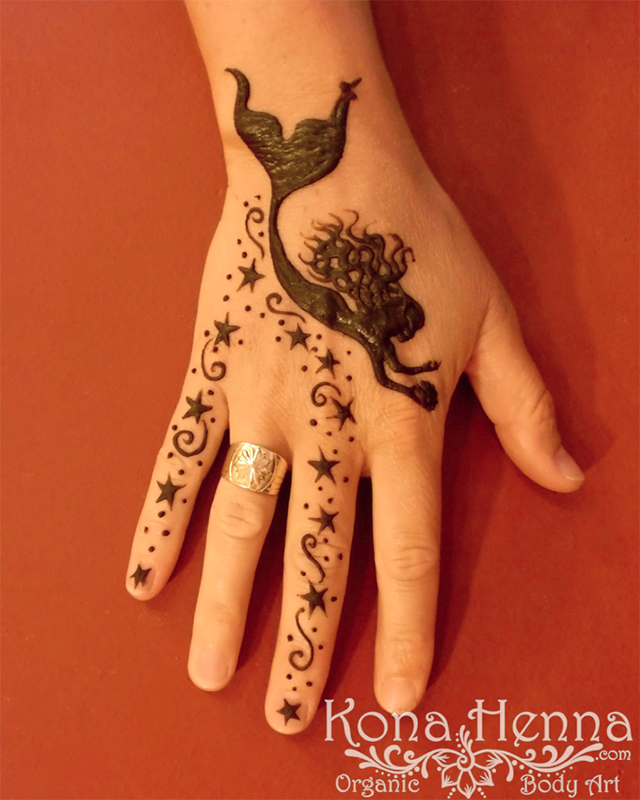 If you’re thinking about giving henna a go, give yourself some time to swim through a few different designs. Henna can last for 1-4 weeks, though it looks the freshest in the first week. 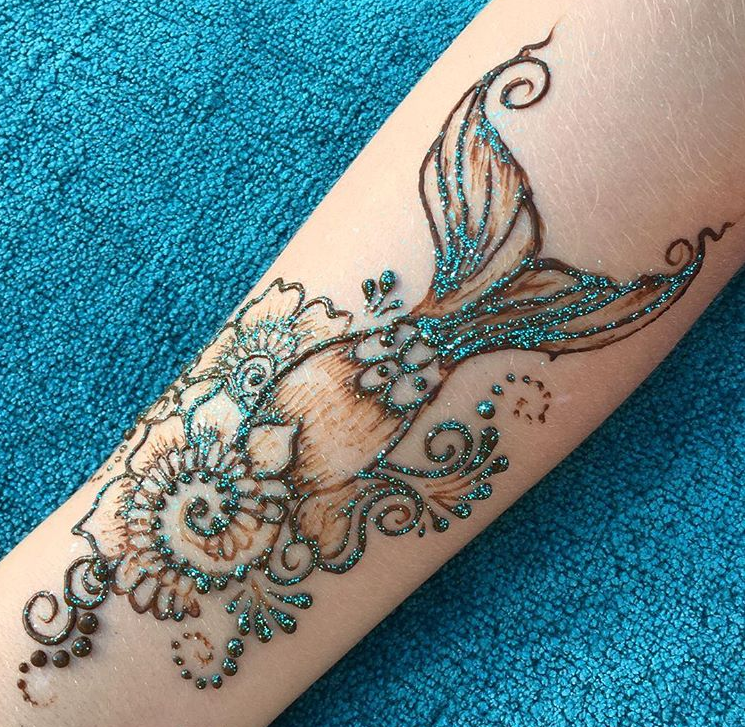 We’re flipping for this mermaid tail art embellished with blue sparkles and flower designs. Sometimes the boldest look involves just one color! You’ll embrace the black once you see how this mermaid silhouette surrounded by starfish contrasts beautifully against the skin! Don’t stop at the hands! 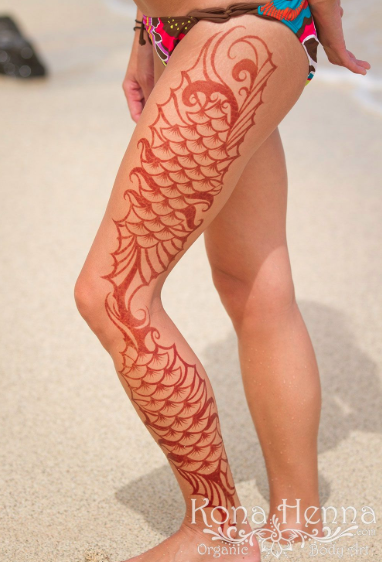 Go for a seriously dramatic look at the beach with henna scales that reach down your entire arm or leg! 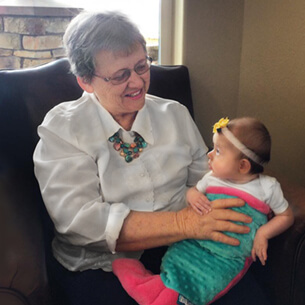 Of course, if you’re planning to rock your mermaid tail, you may want to skip the leg work completely. Perhaps the simplest form of body art is a temporary tattoo, as it involves a simple wet-and-peel application. Will you choose a bold rainbow palette or chic monotone scales? 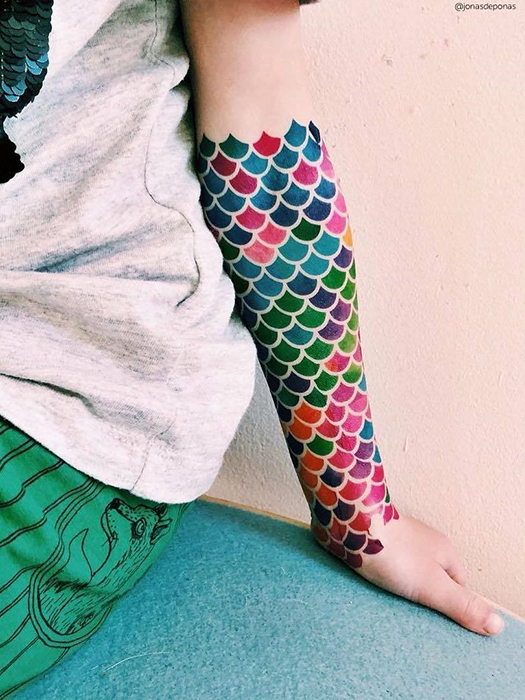 We love how the scales shimmer in shapes you can craft yourself in this ready-to-go tattoo set! The templates included in this kit offer quick and easy ocean shapes. 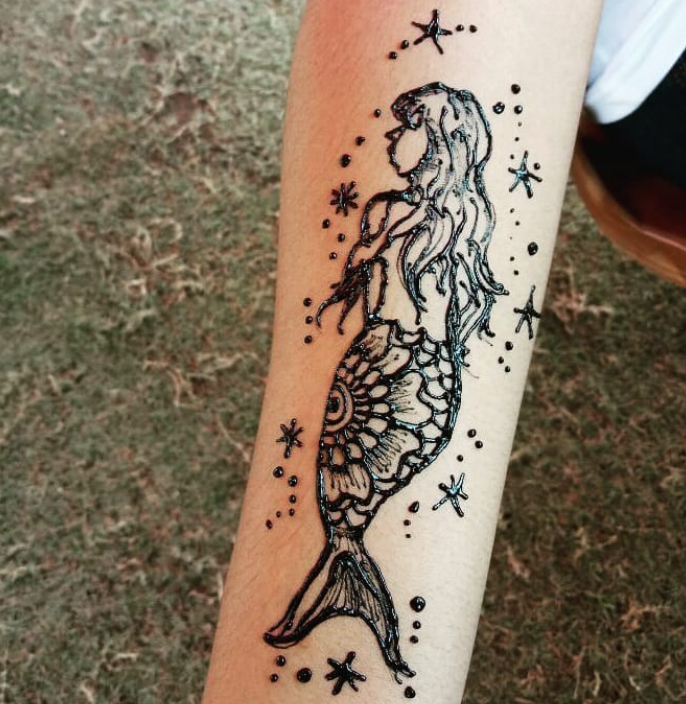 How will you show your mermaid side? We want to see your beautiful body art! 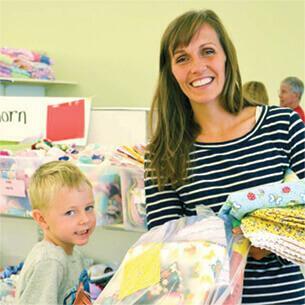 Send pics to social@finfun.com for a chance to be featured on our social media channels.